Swim jammers offer comfort, coverage, performance, and style. Wearing the best swim jammers will enable you to swim faster. The tight fit allows for easy movement and reduces the movement of muscle in the water reducing drag. The water repellent surface reduces friction in the water. Wearing jammers, you will feel sleek in the water and glide forward smoothly. This is why jammers are popular racing swimsuits. You too can enjoy these benefits and reach your best speed with any of the ten best jammers for swimming reviewed below. Speedo is such a dominant player when it comes to competition jammers that jammers are even referred to as `Speedos'. The Speedo Endurance are top rated jammers for swimming. Most swimmers agree that they are one of the most durable active swimsuits and a solid investment. They are made of Speedo's longest-lasting Endurance+ polyester fabric that can stand up to the abuse of chlorine and resists sagging, bagging, fading and snagging to last 20 times longer than regular swimsuit materials. The fabric has low moisture absorption and is also quick drying. The seams have flatlock stitching. Sizing goes all the way up to size 44. Four-way stretch technology and compression provide a body-hugging fit. There is a drawcord at the waist for optimal fit. 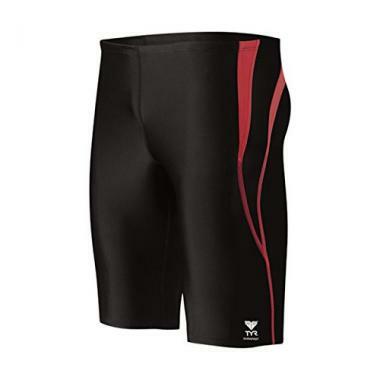 Tyr Jammers have a great fit and last a long time. The TYR Durafast is comparable to the Speedo Endurance. It is made with 100% polyester Durafast fabric that also lasts 20 times longer than regular swimwear. This fabric is 100% chlorine proof and has 100% colorfastness and sun resistance. Compared to the Speedo Endurance, the TYR Durafast costs a little bit less. TYR material is also much more giving and therefore more comfortable. A compressive fit, 4-Way stretch technology and an adjustable drawcord waist offer a comfortable yet secure fit and a free range of motion. 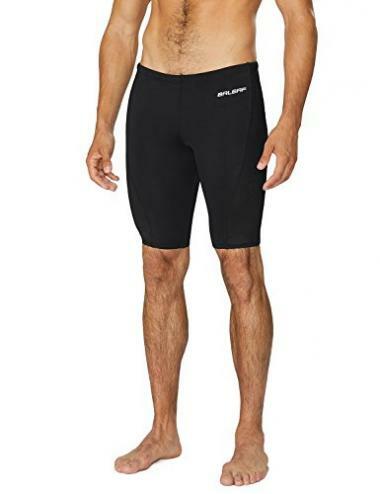 If you want a great pair of jammer swimsuit but are on a tight budget, these Baleaf men swim jammers are affordable and top rated jammers for swimming. Their thickness is substantial and durability solid, as they are made of 90% polyester + 10% spandex and have a 100% polyester lining, which provides modesty and support. This material is also chlorine resistant, retains color and shape and offers UPF 50+ sun protection. The drawstring waist ensures optimal fit. For the price and thickness, these jammers are great for training, kayaking, surfing, and other beach activities. If you like the durability of the TYR Durafast fabric but prefer an interesting design with a touch of color, this is it. A best selling and top rated jammers for swimming, the TYR Alliance Durafast Splice Jammer is made of the 100% polyester Durafast fabric, which makes it long-lasting, chlorine resistant, UV resistant, and fade resistant. The material is thick enough to provide modesty. 4-way stretch technology gives the material some give so it has a comfortable fit. This is another attractive Splice Jammer from TYR but this one is made of 80% nylon and 20% lycra, which is great for performance. It compresses the muscles reducing drag in the water while providing support and coverage. This fabric is recycled, making these eco-friendly swim jammers. Though thin and light, the material holds up very well. Due to the lycra component, it maintains its stretch-ability without becoming overstretched. It resists fading and damage by chlorine, offers UPF 50+ protection and dries quickly. There's a drawstring for a custom fit. Want an inexpensive but quality pair of swimming jammers with style? The Easea splice jammers are a great deal for the price. They are the best swim jammers for swimming laps, surfing, and even triathlon. The fabric is 82% nylon and 18% spandex. The lining is 100% polyester. This makes the jammer very thick and it holds up well. It is also very smooth and comfortable and its swim jammers reviews rave about how good it feels. Its performance is awesome. The tight fit and seamless construction reduce drag and this swimsuit also enhances muscle compression. The fabric is hydrophobic, quick drying, chlorine, UV, and fade resistant and also has an antimicrobial treatment. The waistband is elastic. 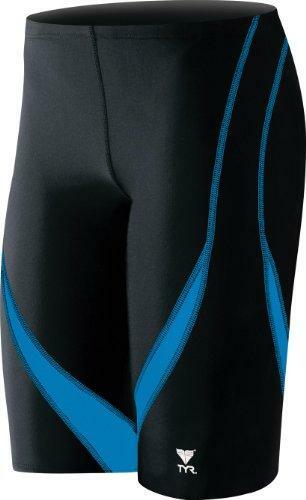 These cool swim jammers by SWIM ELITE have all the best performance features. The snug fit, seamless design, and water repellent sleek exterior reduce water resistance propelling your forward. The snug fit also compresses muscles so they don't fatigue or reduce speed. The elastic drawstring grants an optimal fit. The material is lightweight, breathable, soft and has a smooth feel. It stretches well and retains its shape. Even though it is ultra-thin, the material is of great quality. It is chlorine-resistant, chemical free, quick drying, and retains color well. The seams are flat-locked so chaffing is not an issue. They come with a waterproof carrying case. It won't get the other items in your swim bag wet. Kanu apparel has great quality, function, fit and style. These here are budget Jammers but their quality and durability make them a solid alternative to brand name Jammers. Since they are made of a heavier weight material that is 83% polyester and 17% spandex, there are no fading, stitching, or see-through issues. The fabric also offers UPF 50+ sun protection and dries quickly. Their fit is snug and comfortable. They are very flexible and great for swimming, training, surfing, triathlon, and working out. Matching kids jammers are available. These fashionable jammers are made of 82% nylon and 18% spandex. This material is light and stretchy, which leads to good performance. They are shorter in leg length than typical jammers. The fabric gives them a really comfortable fit and there is a drawstring for adjusting the fit at the waist. The quality of the jammers is pretty good for the price. On the front is a double material for modesty. The Onvous AquaGenesis-Lite jammers are lightweight, flexible for all stroke styles, comfortable and yield fast performance. The water resistant and quick drying 82% polyester and 18% spandex fabric minimizes drag and the stretch compresses the muscles creating an optimal streamlined outline and freedom of movement. Because of the stretch fit, the jammers are easy to put on and take off. The overall workmanship is good and the level of quality given the price is amazing. There is a double layer of fabric on the front panel for modesty. These jammers are designed to be compressive and tight-fitting. For a more relaxed fit, order one size up. There's a hidden drawstring for adjusting the fit. Good jammers that are too baggy or too tight are useless. It is, therefore, very important to get the right size. Jammer swimsuits work by waist size. Measure your waist and refer to a product’s sizing information to determine the perfect size for you. Check swim jammers reviews to find out if a jammer is a true fit or runs big or small. Competition jammers should be compressive and form fitting but not uncomfortably tight. 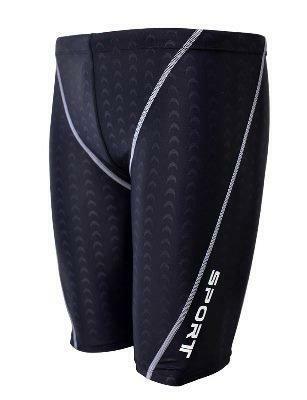 The snug fit allows for easy movement in the water and compresses leg muscles enabling peak speed. Swim jammers should also flex for an easy fit and have a drawcord at the waist for optimal fit. Make sure you order a pair that will be a good fit for you. Saltwater or chlorinated pool water is pretty tough on swimsuits. You need a durable jammer that will resist fading, sagging, bagging, and quick disintegration. Swim jammers made with UV and chlorine-resistant polyester have superior durability. 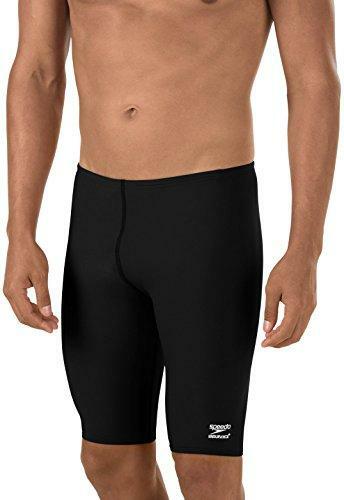 Swim jammers made of a combination of nylon and lycra/spandex are lightweight, water resistant, quick drying and fit comfortably. Those made of polyester have superior durability but don’t yield the best speed. They are ideal for training. A thick material at the crotch is essential for modesty. The material, cut, fit, and compression of a jammer swimsuit all contribute to its performance. Ensure the swimsuit you pick has the ability to help you reach your peak performance whether you want to swim faster freestyle or breaststroke. A water repellent fabric, compression, and a stretchy fit are essential. Bonded seams are faster than stitched seams. Q: What Are Swimming Jammers? 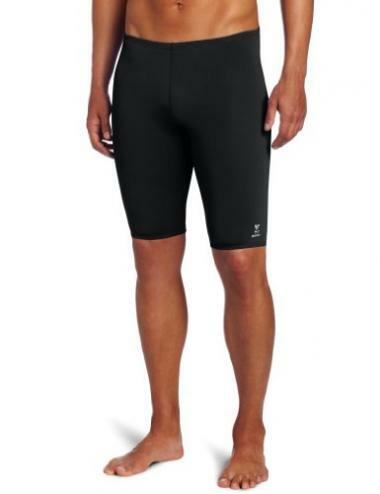 A: A jammer is a type of men’s swimsuit that is form fitting, knee length and doesn’t go above the waist. 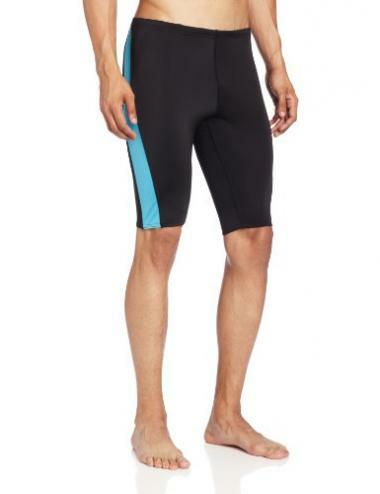 Because of their speed advantages, jammers are some of the best competition swimsuits for men. Q: What Are The Benefits Of Wearing A Swimming Jammers? A: Wearing swimming jammers yields speed benefits. Competition jammers reduce drag and give a springy effect to the legs increasing the efficiency of the forward motion and boosting speed. The water repellent fabric and snug fit reduce water friction. 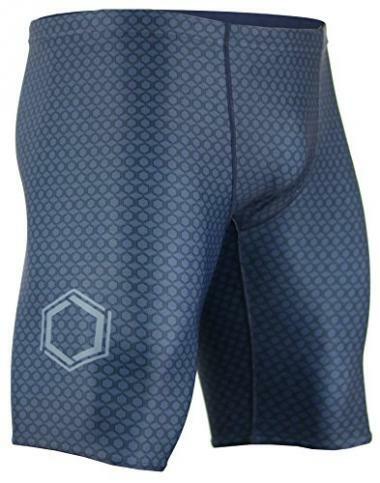 The compression supports muscles, minimizing fatigue and promoting recovery. The stretchy fit makes movement in the water easier. 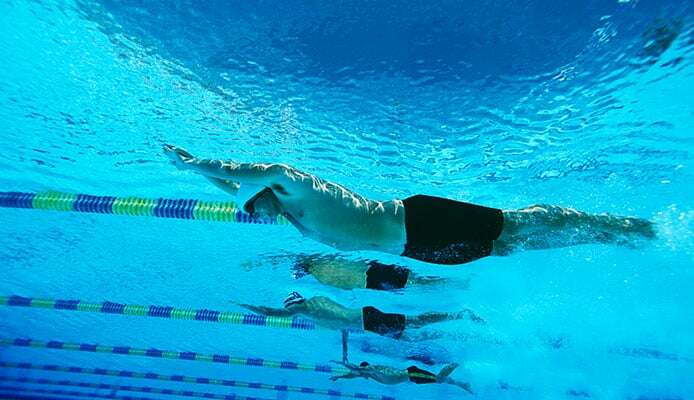 The swimmer faces less resistance in the water and glides smoothly and at high speed. 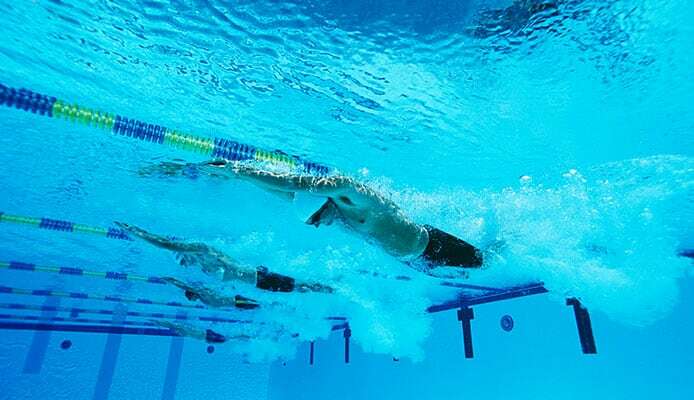 Other ways to swim faster include training with swim paddles and pull buoys. Q: How To Care For My Swimming Jammers So They Last Longer? A: First of all, it is important to avoid contact with abrasive surfaces and follow the care instructions on the tag. After each session, rinse them out thoroughly in a lot of fresh water. It is best to hand wash jammers in cold water and hang or lay them flat to dry. Whether you swim for the health benefits or are a competitive swimmer, you’re most likely to reach peak performance wearing the best swim jammers. They are so much better than swim trunks or briefs, as they provide support and coverage and boost speed. How about you? Which jammer swimsuit is your favorite and why? Let us know in the comment box below!